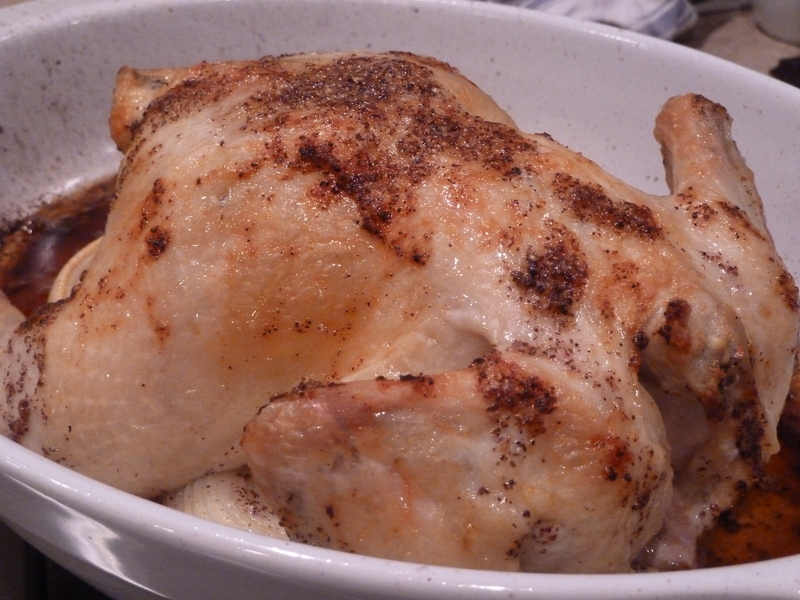 ginger-sumac roasted chicken | Is there any wine left? The recipe actually called for poussins. At first glance, I skipped over it because I thought it called for opossums. I’m from Louisiana but I have to draw the line somewhere. Its somewhere between eating gas station food (good) and eating roadkill (bad). no problem eating poussins; I just I couldn’t find any. The smallest chicken Central Market even had was 3 lbs. So I used that. Other caveat: I didn’t know what sumac was. Turns out its a spice that is really common in Middle Eastern dishes. It has a nice, fruity-tart flavor which is not quite as strong as lemon. Its pretty easy to find; I got some in the bulk section of Central Market. If you happen to be like me and just not have some on hand — and don’t feel like running out in search of it (I hear you here, sister), then just substitute some grated lemon rind. This recipe came from a cookbook I just got as a gift — The Blackberry Farm cookbook. 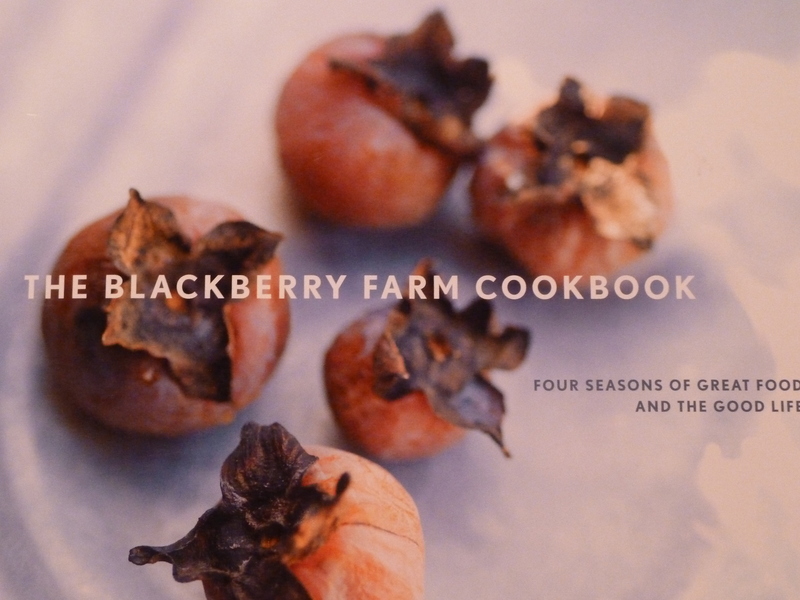 I’ve always wanted to visit Blackberry Farm and was super excited to receive the cookbook! 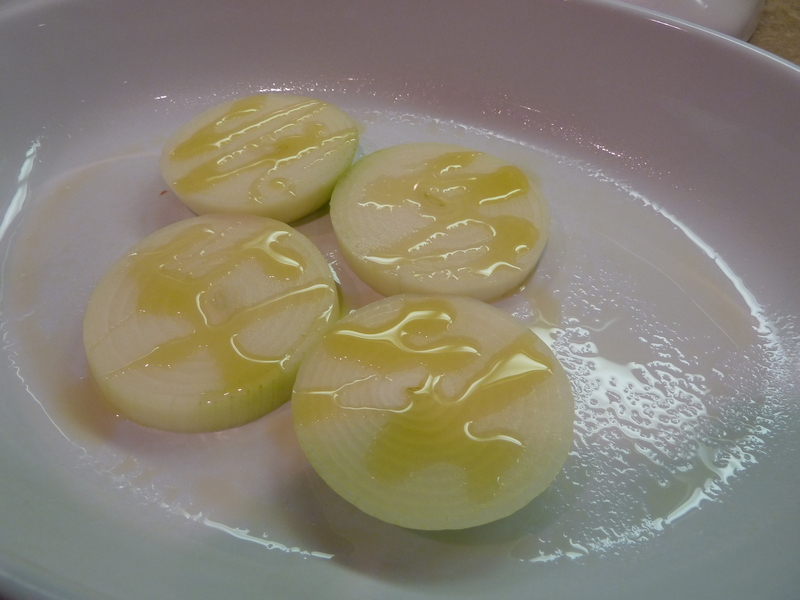 Start by slicing the onion and putting the slices in the bottom of the roasting pan. Drizzle vegetable oil over the onions. In a small bowl, combine the softened butter, sumac, grated ginger, salt and pepper with a fork. Rinse the chicken and pat it dry with a paper towel. Really dry. You are going to want butter to stick to it in a minute. 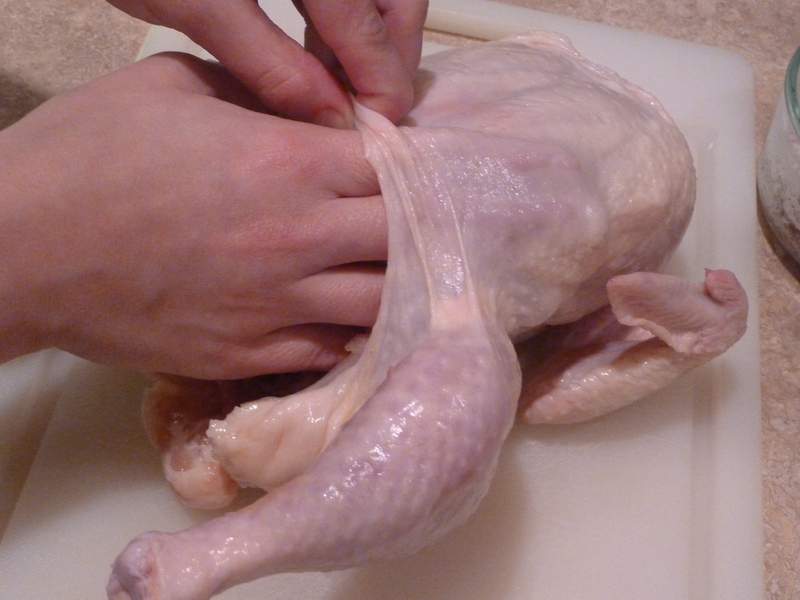 First though, stick your fingers underneath the skin on the breasts and separate it from the breast meat. Push about a third of the butter mixture under the skin in an even layer. Spread the rest on the outside of the chicken, then place the chicken on top of the onions in the pan. Bake at 475 for about 40 minutes, then lower the oven temperature to 350 and roast for 20 more minutes. Its going to start smelling really good around the 30 minute mark. But its still raw. Wait until a thermometer in the thickest part of the breast reads 170. Let your chicken rest for 5 minutes before carving. 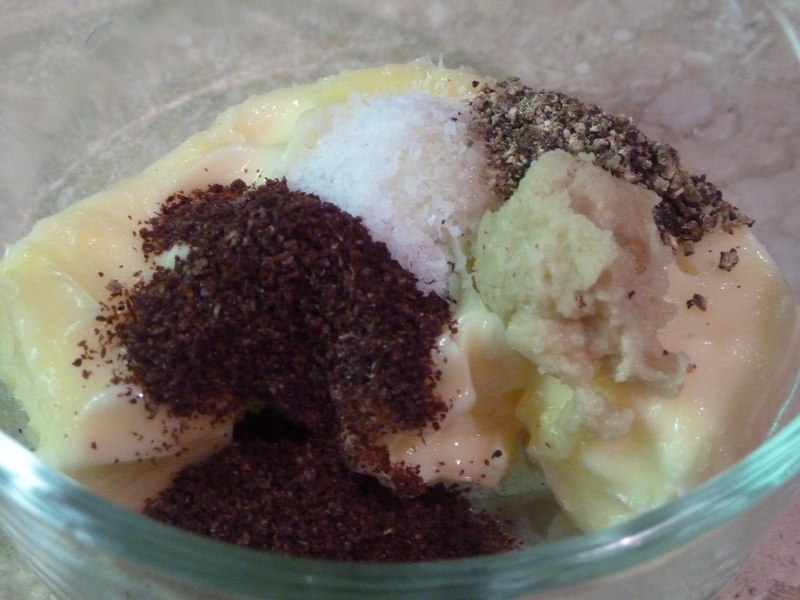 1 tablespoon ground sumac (zest of one lemon or a teaspoon of lemon juice can be used instead). Cut the onion into 1/4 inch thick slices. Place the slices in a roasting pan, brush them with the oil, and set the pan aside. 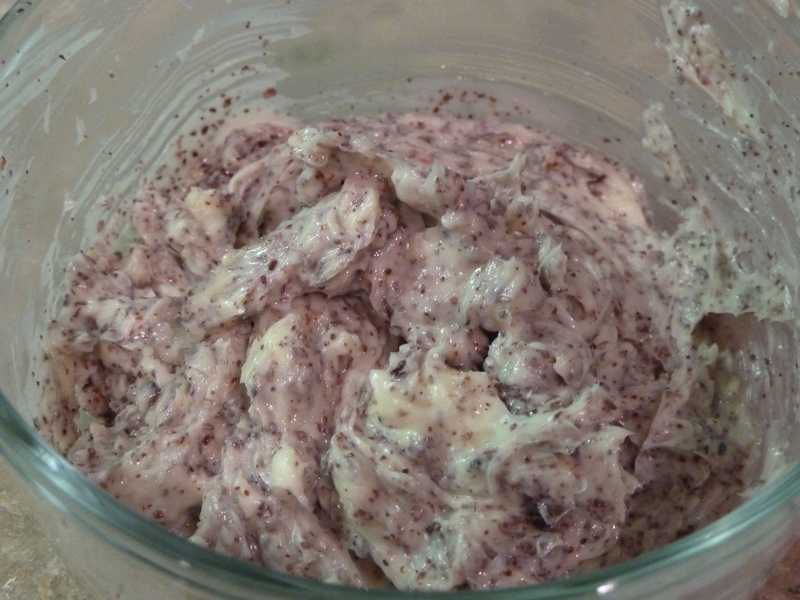 In a small bowl, stir together the butter, sumac, ginger, and ½ teaspoon of the salt; set aside. 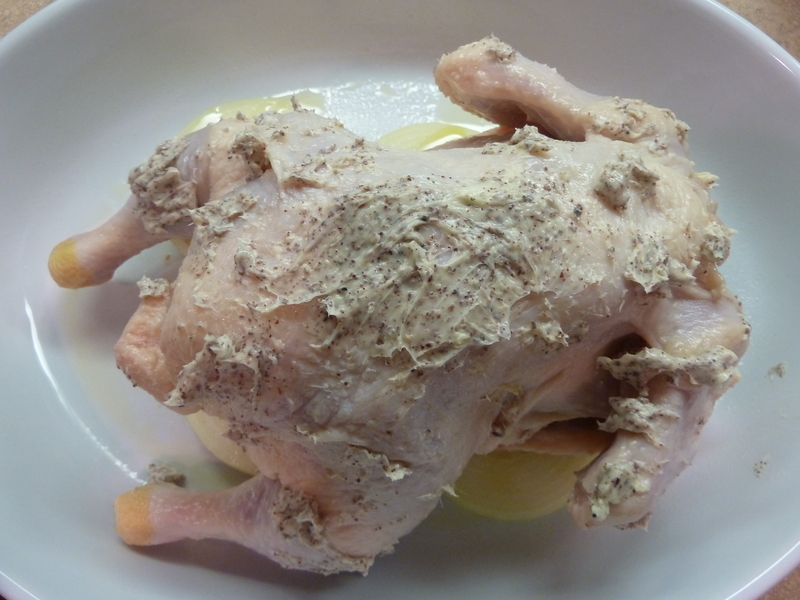 Rinse the chicken inside and out under cold running water and pat it dry with paper towels. Sprinkle it inside and out with the remaining 1 teaspoon salt. Use your fingers to gently loosen the skin over the breasts, being careful not to puncture the skin. Push about a third of the butter mixture under the skin and over the breast meat, then gently smooth the skin back into place. Massage the skin to evenly distribute the butter. 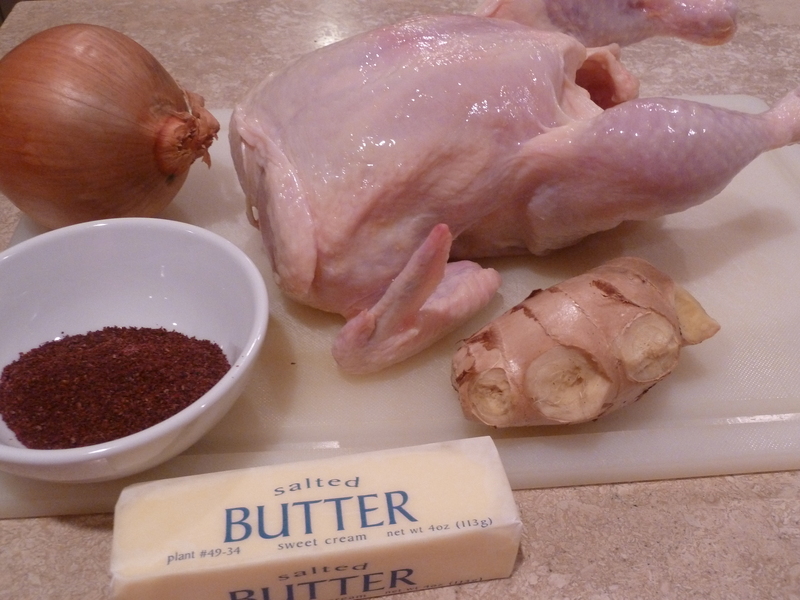 Spread the remaining butter over the entire outside of the chicken. 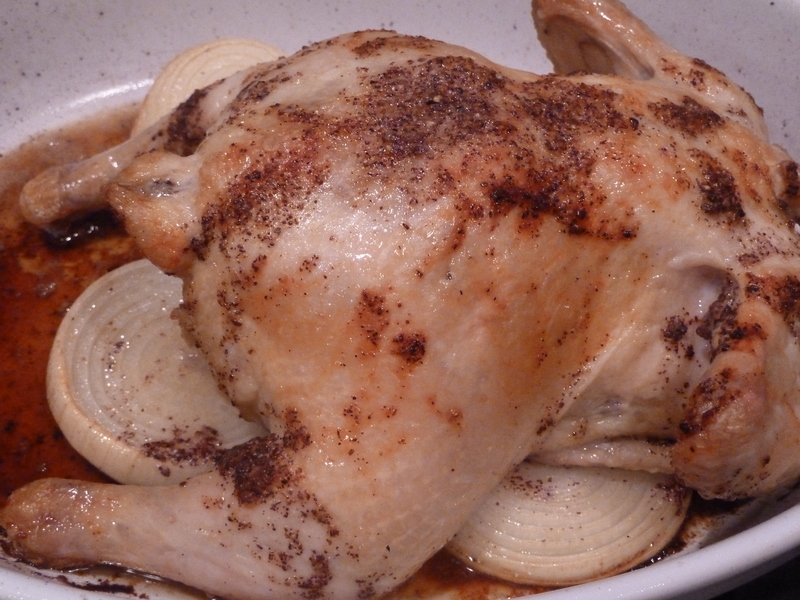 Place the chicken on top of the onion slices in the roasting pan. Roast the chicken for 40 minutes then reduce the oven temperature to 350 degrees and roast for 20 minutes more, or until an instant-read thermometer inserted into the thickest part of the thigh (but not touching bone) registers 170 degrees, or when the juices run clear when the thigh is pierced with the tip of a sharp knife. Let the chicken rest at room temperature for 5 minutes before serving. Taste tester #1 loves this!